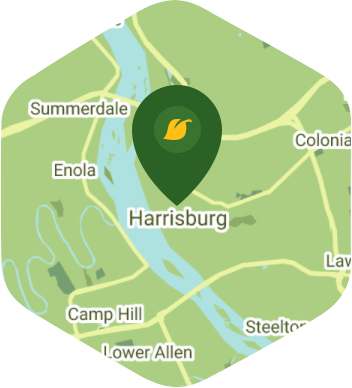 Book a skilled lawn pro in Harrisburg. Backed by a total satisfaction guarantee and amazing customer support. Looking for the top rated Harrisburg, PA lawn care services? Lawn Love is your lawn care service near me answer. Lawn Love has the Harrisburg area covered when it comes to lawn care and lawn care services. If you've ever muttered the words I need affordable lawn care services near me with a click of a button then we're your lawn care service answer. Get an instant quote for lawn care services near you such as lawn aeration, lawn mowing, leaf removal, gutter cleaning, gardening, yard care, weed control and more. See why we're rated the #1 Harrisburg lawn care service company. When people think of Harrisburg, they may think of civil war history or tasty chocolate, but to you, it's simply home. It's the place you've chosen to be a part of a bustling and vibrant community that you know has more to offer than most people realize. With so many distractions outside of work, where do you find the time to both enjoy your free time and spend it doing the things that need to be done, just like lawn care and maintenance? If this is a common problem for you, then Lawn Love may just be the answer. Lawn Love is a fully bonded and insured lawn care service. Our teams of skilled and experienced lawn care technicians want to work with you to create and maintain a lawn you can be proud to call home. We can take care of all the weeding, seeding, mowing, trimming, and clean up – all you have to do is call us to get started. To find out more about Lawn Love and to take advantage of our free, fast and easy two-minute quote, call us today at 717-510-1390! Let us know what is happening every step of the way. Rated 4.65 / 5 stars in 26 Harrisburg customer reviews. There won't be any rain in Harrisburg today, which means you'll probably have to water your lawn. Dusk and dawn are the best times to water your lawn (the sun will rise at 6:26 AM and set at 7:48 PM today in Harrisburg). Here are some average lawn care prices for homes in Harrisburg. Average lawn size 6,694 sq. ft.